My family and I recently traveled to Pittsburgh for the first time; we were naturally excited to explore some place new. When I saw that Pittsburgh advertised itself as Kidsburgh, I took it with a grain of salt. After all, lots of places that advertise themselves as kid-friendly aren’t what they claim. Pittsburgh, however? It gets kid-friendly right. Pittsburgh really seems to understand what families want and need: affordable kid-friendly attractions. Here are a few top things to do in Pittsburgh with kids to ensure you’re experiencing Kidsburgh. While many museums take a “do not touch” approach, I found that the museums of Pittsburgh really understand that kids want to explore and be interactive with their environment. Carnegie Science Center is made just for kids and my kids couldn’t get enough! Children are encouraged to get hands on, explore their environment, discover how things work, and challenge themselves to think outside the box. 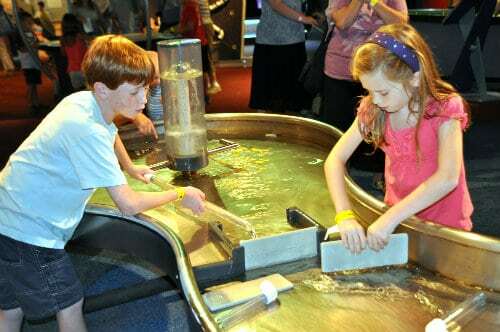 A few of the Carnegie Science Center best features include: Roboworld, the largest permanent robotic exhibit to be found, a submarine to explore, a planetarium, and an Omnimax® theater just to name a few. Be sure to allow time to play in the SportsWorks center where kids can rock climb, play a giant game of Operation, or challenge each other to a sprint. The Children’s Museum of Pittsburgh is another museum designed just for kids. Families will enjoy exploring Mr. Rogers’ Neighborhood (did you know he was a Pittsburgh native? ), build machines, and get creative. As a family, we really loved Carnegie Museum of Art and Natural History. Here you get two fantastic museums in one! Most kids are enthralled by the dinosaurs but beyond that, throughout the entire museum kids will find interactive areas designed just for them including fossil digging, the discovery room, and learning stations. Parents will love that they get to enjoy a little culture and their kids are actually learning while having fun. The Senator John Heinz Pittsburgh History Center was a pleasant surprise. Take a journey from the 1700s through to the present and learn about the innovations of the times. Not only do they have a Kidsburgh section, they have lots of things for the kids to do throughout the museum. In the Sports Museum area, they can even try out bocce ball or golf. As a parent, I really loved that the museum encouraged kids to get active and healthy by encouraging them to take the stairs. With the Smart Steps program, kids punch a card after each flight they climb. Once they’ve climbed all six flights they can turn their completed card in for a small trinket at the museum shop. The Pittsburgh Zoo and PPG Aquarium is another two-for-one destination. 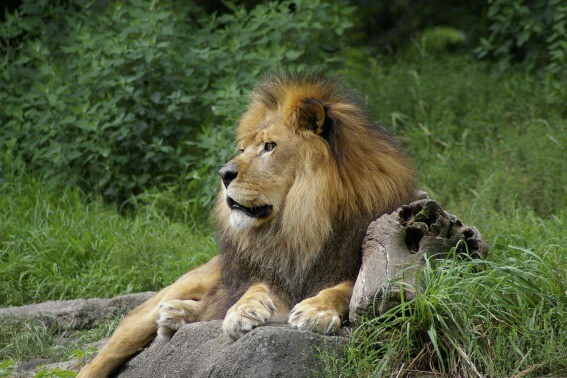 With over 2,000 animals to observe, everyone is sure to find his/her favorite. We even enjoyed seeing some babies that joined the crew! What sets this zoo apart from others we have visited is the Kid’s Kingdom and Discovery Pavilion. Here kids can take a break from viewing the animals and climb on the climbing structures, slide down slides, ride on a scooter, and enjoy more interactive fun. The addition of the aquarium is also great and I have not seen this in other zoos we have been to. We were there on a hot day and enjoyed being able to step into the air conditioning and explore more exhibits. The kids loved the ray touch tank and the shark tunnel most of all. At the National Aviary, families can enjoy friends of the feathered variety. Families explore different habitats and observe a variety of exotic birds. Kids will especially enjoy the penguin area where they can crawl under tubes and get an underwater view. Taking the time for a feeding session allows for some more interactive fun. Not only did we learn more about the birds inhabiting the area, the kids got to hand feed some of the friendlier birds. If all these adventures have you looking for a place to rest your head, check out our choices for the Top Family-Friendly Hotels in Pittsburgh. One of the best parts of Pittsburgh is where it is located. Three rivers, the Allegheny, Monongahela, and the Ohio, all meet at one point. Visitors can come to the point where these rivers join at Point State Park. This is a perfect spot to stroll along the promenade, sit at the fountain, or visit the Fort Pitt Museum. Point State Park also hosts many concerts and festivals during the year. However, to really enjoy the rivers, you need to get in them! Change up your view of the city and climb aboard Just Ducky Tours. This land and water adventure gives you a tour of the best Pittsburgh has to offer through the historical downtown and business districts before dipping into the water. The kids are enthralled by getting a chance to drive the duck! This is a fun and unique way for the entire family to enjoy a guided tour of the city. My favorite view point came from the side of Pittsburgh’s steep hills aboard the inclines. The inclines were built more than a century ago and once served as a popular mode of transportation up these steep hills. 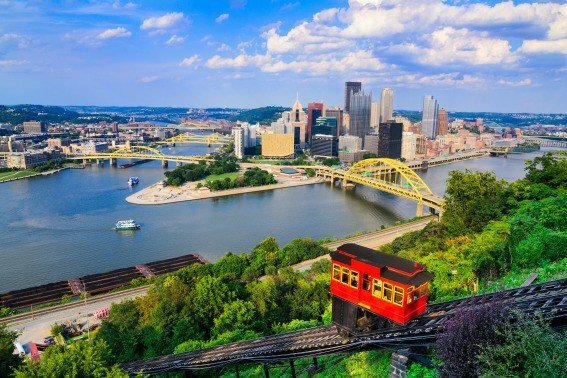 Whether you choose to ride the Duquesne Incline or the Monongahela Incline, both will treat you to spectacular sweeping views of the city from the top of Mount Washington. A century old Pittsburgh tradition is a visit to Kennywood amusement park. This family favorite was designated as a National Historic Landmark and is known as the roller coaster capital of the world. Even if roller coasters aren’t your thing, it features many traditional amusement rides. 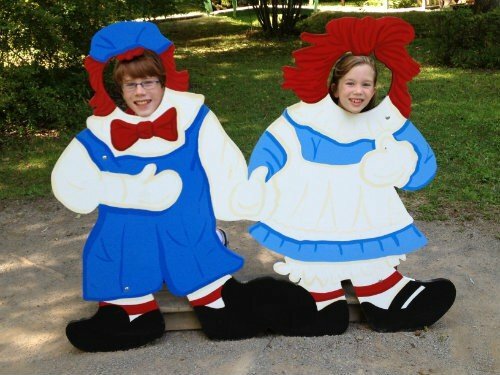 Some are perfect for the younger set making Kennywood a fun visit for all ages. For those of you looking to cool off on a hot day, head to Sandcastle Waterpark. The best tip we’ve gotten is to not wait for the hottest day of the year because it is so popular it gets very crowded. The bravest in your clan will enjoy the fast, thrilling water slides while the more tame can float in the lazy river, soak in the hot tub, and explore the boardwalk. A short ride from Pittsburgh is another gem, Idlewild and Soak Zone. We found this to be a tamer amusement park and perfect for the smaller set. Stroll through Storybook Forest, ride aboard the trolley through Mr. Rogers’ Neighborhood, and ride some fun rides throughout the park. Pack a picnic lunch and make a whole day of it. 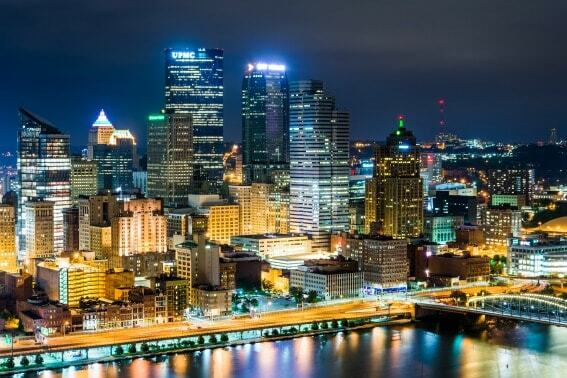 There are so many fabulous activities to do with your family in Pittsburgh you will need to stay a few days to have a chance to experience them all. Find the perfect hotel for your family and then book your stay! All photos credited to the author unless otherwise noted. Disclosure: The author and her family received a complimentary two night stay at the Hampton Inn and Suites Downtown Pittsburgh and a press pass to visit many of the attractions listed courtesy of Visit Pittsburgh. The author was not asked to express a particular point of view. Reviews and recommendations are based on the author’s experiences and are her own. Looks great, and there is a lot more there than we thought. Well written post Beth.